"Restore Windows Registry - Should You Use Software or Do it On Your Own?" Why and when you need to restore Windows registry? Well, if you computer having problem, you can try to restore the registry and see whether can solve the problem or not. This is because sometimes computer systems fail to start not because of a third party application or a virus but of a corrupted registry. Windows registry recovery procedure restores the damaged or corrupted Windows registry files. It enables the system to return its previous state by recovering all the data before the problem has occurred. But the problem is how to perform the registry recovery? In order to do the registry restoration, you must backup the registry BEFORE it gets corrupted. If you are unsure how to backup, read the step-by-step guide here on backup windows registry. The Import command available on the Register Editor allows you to import previously exported registry files in ASCII or REG format. 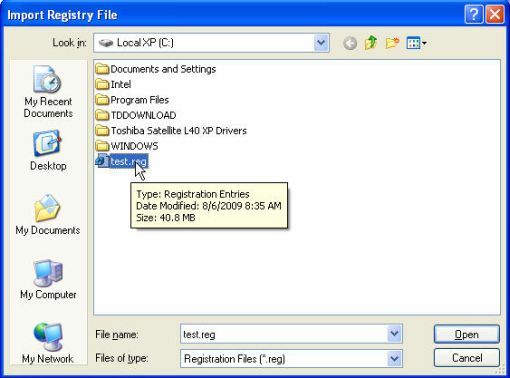 Open the Windows Registry Editor as illustrated in another article. From the Import Registry File dialog box displayed, use the Look in: drop down menu to browse to the location where you save/backup the registry file (with .reg) before. Select the file and click the Open button. The registry file will be restoring back. Note: In case if you are unable to logon to the Windows desktop, you can use the Windows Safe Mode to logon. This is a special mode in which Windows starts up in a raw state and without loading most of the devices driver. To get into safe mode, restart the computer. When the screen is black (and before the Windows logo appears), hit the F8 key several times until a menu appears. Use the up or down arrow key to choose Safe Mode, and press Enter. Once you logon using the safe mode, try to restore Windows registry. You also can use registry software such as Registry Easy to help you on this.